Justin Bieber Tweets That He’s Gearing Up For Touring Again — Get Ready Beliebers! Justin’s fans are impatiently awaiting his return to touring, but thankfully it’s in the works! Justin Bieber is keeping his 12,619,966 Twitter followers in the know about what he’s up to, as usual, and there are about to be thousands less “lonely girls” in Mexico and S. America! Read what he tweeted! Justin will be collaborating with Boyz II Men on a charity Christmas album. — Are you more excited for his tour or his new album!? The hottest teen couple of Hollywood, Justin Bieber and Selena Gomez were spotted together shopping and going to movies on Tuesday in Los Angeles.The 17-year-old pop sensation, Justin Bieber and his 19-year-old songstress girlfriend Selena Gomez were spotted, by their fans on their date night in Los Angeles on September 13, 2011. It was reported that, the teen couple was behaving like average teenagers. The reports also suggested that, the couple was strolling through downtown in the city along with Kenny, the bodyguard of Bieber. It looks like, Kenny has become the shadow of Bieber. Besides shopping by the romantic couple, they were also spotted at a screening of ‘Laugh at My Pain’ directed by Kevin Hart at Universal City Walk at 10.30PM. They have been inseparable in recent times, since Bieber has returned from his World tour. They have been on to multiple dates and holidays at various parts of US and Canada. They even visited their families and spent with them. They have finally confirmed about their romantic relationship. Bieber has been following his lady love, as Selena is performing in her concert in the United States. He has been taking care of her very much. He even visited her at Los Angles studio, during her rehearsals for her concert. However, Bieber is busy, working on his new albums. He has also reportedly collaborated with Boyz II Men for the new Christmas album. On the other hand, Selena has a month of time, before she heads for her ‘We Own the Night Tour’ in Canada. Justin Bieber always tells his fans to “never say never” and he did just that. Now one of his biggest dreams is coming true — he recorded a song with his idols, Boyz II Men. Boyz II Men seems to be excited too! Justin is almost done with his highly anticipated holiday CD. Justin Bieber is looking to make the world a better place and he’s looking to his fans to help him out as he cannot do it on his own. Justin is looking to make the biggest digital chain of hearts across the web. If you join his campaign you will be joining a great cause, all you have to do is send him your hearts. Once he has reached his goal donors and proceeds from his fragrance ‘Someday’ he promises to build 50 schools for underprivileged kids. You can check out the campaign below. Joining is fairly simple, all you have to do is upload your picture as if were joining others in the heart chain. Meanwhile, Justin Bieber is getting a lot of help with his forthcoming Christmas album. Already the ‘Baby’ singer has already recorded songs with Taylor Swift, Sean Kingston and even 90′s R&B group Boyz II Men. Now it’s likely that the Boyz are getting what’s known as a “Bieber Boost” as girls who weren’t yet born when “End of the Road” was the world’s biggest slow jam rush to acquaint themselves with decades of perfect harmonization. Luckily, the Boyz are making it easy on Beliebers, as they’ll soon release the LP Twenty in honor of the group’s two decades in the music business. The album will feature 10 new songs in addition to 10 updated versions of their classic hits. Will you joining Justin’s campaign? Beliebers have another reason to look forward to the celebration of the birth of Jesus Christ: a new Justin Bieber Christmas album. At an event during New York Fashion Week Monday, Bieber told OK! Magazine all about working on two upcoming albums at the same time. "It's crazy. I started a little bit on my actual album, but I've been really focusing on my Christmas album," Bieber said. "We just got it finished so I'm like really excited about the final outcome." Bieber went on to describe the exhilaration of making a new album and the satisfaction of finishing it. "It was really incredible. Really just glad to be done with that and start with my album," the pop star said. If any fans happen to be worried that a new Christmas album will be nothing but Bieber singing "Rudolph the Red-Nosed Reindeer" and "Jingle Bells," they will be in for a happy surprise. "There are a couple original songs, a couple classics, but mostly originals," Bieber said. Although it is supposed to be a Christmas album, Bieber hinted that his fans might not have to wait until December 25 to have a "Belieber" Christmas. "Thinking about starting Christmas early...like november. #newmusic," he tweeted yesterday. Fans responded to Bieber on Twitter with their usual enthusiasm. “That just made my day," tweeted YeahItsJenayy. "Does this mean Christmas album AND #believe in the same month? #swag :)"
The "#believe" hashtag refers to Bieber’s highly anticipated follow-up album to his massively successful "My World" and "My World 2.0." "Believe" is slated for a November 15 release. Justin Bieber has revealed that he might get himself a university degree in years to come. 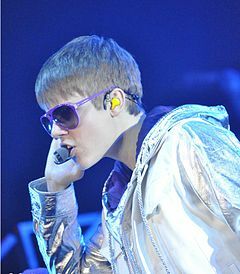 The 17-year-old singer, who is dating Selena Gomez, said that he has a back-up plan if his music career starts to wane. “I’m not ruling out going to university at some point in the future,” he told the Daily Star. “I’m just saying that at this point I’m 17 and I plan on doing this for a long time. 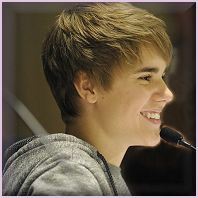 Justin Bieber: Flirty, Caring, Geeky and Talented! Justin Bieber has so many great attributes that it's hard to pick the best one! There are so many reasons that teens and tweens love JB. What are they? According to author Ally Azzarelli, who recently released the book Justin Bieber Teen Music Superstar, there are ten reasons to love the Biebs most. Of course, there are more than ten reasons why he is amazing and one of the world's most popular male singers under 20, but ten reasons will suffice for now! Firstly, according to Ally, Justin is family oriented which is super sweet and great to see. He's also multi-talented, charitable, stylish and a prankster. Can't you just see why Selena Gomez is so in love with him? He's got it all! Do you agree with the aforementioned qualities? While most people don't know Justin Bieber on a personal level, many of these qualities are easy to see. His style, for one, can be noticed in any photograph and of course his talent is easy to see as well! But what about the others? Do you think JB is caring or charitable like Ally says? Despite being a mega superstar with thousands of fans loving every bit of him, Justin Bieber has admitted that he was "shocked" when Selena Gomez agreed to go on a date with him. Complimenting his girlfriend on how beautiful she is, Showbiz Spy reports JB saying: "I was pretty shocked myself. She's very beautiful. We started as friends like two years ago, so we've been friends for a long time, so that's pretty much kind of how it started." The Baby hit maker then went onto reveal that he was already attached when him and Selena became friends. The star coyly added: "I had a girlfriend when Selena was my friend." Footage of Justin leaving a recording studio and hitting a Boston Market with Alfredo Flores, Kenny Hamilton and Kenny's little boy. Justin Bieber helping out DefTal DJ Rage at Selena Gomez's after party. Justin Bieber indulged in an impromptu drum solo during rehearsals for the MTV Video Music Awards, and in doing so raised the eyebrows of band members who were in temporary possession of the drum kit. According to ThyBlackMan.com, the band that was rehearsing--Cobra Starship--took a break during pre-VMA rehearsals. While on break, the Biebs hopped onto the drums and let rip a pretty darn impressive drum solo. The band members, who had rented the drum kit for the event, had a few things to say about it. "I heard about that, that Justin Bieber was playing our kit," Cobra bassist Alex Suarez said. "It's a rental," drummer Nate Novarro felt it vital to interject. Of course neither Suarez nor Novarro said whether or not they were okay with Bieber hijacking their drums and taking them for a little ride. Are they afraid they'll stir up something that could push their band into an unfavorable spotlight? Novarro hinted at this, but kept his answer fairly lighthearted when he was asked. "Kind of, but [ Justin Bieber ] could beat me up, so I can't approach him and say anything," Novarro said. Of course, Justin would never beat anyone up over something like that. The kid is as harmless as harmless can be. It wasn't the first time he had borrowed Cobra Starship's drum kit, however. 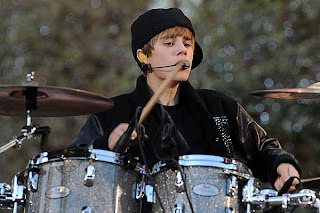 In fact it was back in 2009 at the Jingle Ball, held in Sacramento, when the Biebs hijacked the drums on stage. Okay, he didn't really hijack them that time. Instead he was challenged to a dance-off by the band's front man Gabe Saporta. Since Justin was recovering from a broken foot at the time, he certainly couldn't dance. But he could still play the drums, and wanted to be sure that the band members knew it. Nate Novarro says he likely made the mistake that gave Bieber full reign over the band's drums--possibly for life. "He showed me what he could do, and it was good, so I was like, 'You can come back and do it whenever you want,' " he said. "I think he just took full advantage of that." So no harm was done when Justin Bieber showed off his drumming skills using Cobra Starship's rented drum kit. Should other bands beware when the Biebs is around? Are they safe leaving their drums unsupervised when they go on break? That remains to be seen. What doesn't, however, is that Justin Bieber is definitely multi-talented and isn't afraid to let loose and enjoy a little music--even during his down time. Justin wasn't even performing for the VMAs. He was only there to support his girlfriend Selena Gomez, and to hopefully receive the award for which he was nominated. And yes, he did win the VMA. Justin Bieber is the latest star to pay tribute and remember the terrorists acts of 9/11. On this ten-year anniversary, many are taking to Facebook and Twitter to pay respects and share memories. Certainly a great way to use the social media sites and help the grieving process that 9/11 caused for many. Justin Bieber tweeted his fans saying "as a canadian we too remember 9-11. i was just a kid and remember it well. today we honor the memory of those lost and move forward together." He then followed up with another tweet saying "God Bless" and one saying RIP to those lost on the tragic day. It's nice to see young stars like Bieber paying their respects, even if they were young when the tragedy happened. It's very important for all ages to remember and share. Demi Lovato also took to her Facebook page to remember 9/11. She asked fans to comment with their memories and thus far around 300 have joined her on the page. Again, these two are really stepping up and proving themselves to be role models and inspirations. Justin Bieber seems to have "disappointed" some people with his recent admission that he has no college plans. Which is pretty silly really. If and when he wants to pursue higher learning, he can surely do so. At the rate he's going, he'll be able to buy his own small college where he can be the only student if he's so inclined. Far more shocking were JB's other revelations. By his own admission, the Teen Dream never liked school much at all. When he was younger, his teachers were mean to him. Yes, impossible as it sounds, Justin Bieber confessed in an interview at Dolce & Gabbana's Fashion's Night Out on September 8, that he wasn't exactly a teachers' pet in school. Far from it. "... there were a lot of teachers that were mean to me," Justin recalled. "...teachers were mean to me, if you can believe it." It is indeed difficult to believe that teachers--or anyone else for that matter--could be mean to cute little baby-faced Justin Bieber. How dare they? How could they? Why were they? The answer to all those questions is shockingly simple. "Because I was a bad kid," JB continued. "...I just talked a lot in class." "No actually, I really don't. [High school] is so dramatic. I hate drama!" So, there you have it. Justin Bieber was a bad boy targeted by mean elementary school teachers, and he hates high school because it's too dramatic. Actually, JB is right about high school. It's full of drama. Not to mention jerks. Five to six hundred young people met at the Hlemmur bus station and all of them had one thing on their mind: to grab some media attention, and hopefully by extension, the attention of one Justin Bieber — the biggest thing to come out of Canada since sliced maple syrup. IceNews is only too happy to help. 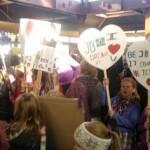 The ‘protesters” message was clear: come and visit Iceland please, Justin. After meeting, the placard-bearing, chanting mob made their way from the bus station, down Laugavegur shopping street and onward to Laekjatorg square. The rally was organised by a group of 13-15 year old girls; including Thora Silja Hallsdottir. Visir.is tried to interview her during the march, but the journalist had a hard time hearing her over the pandemonium all around. “This is completely insane!” was the main point Hallsdottir was able to convey. She organised the Justin Bieber March with her friends, Lovisa Thora, Gudrun Brynja, Anita Ros Thorsteinsdottir and Audur Ivarsdottir. The rally seems to have achieved its goal of proving to the pop god Bieber that there are plenty enough fans in Iceland to warrant a concert in the country — if some 600 people are willing to turn out and march for it, he should have no problem filling a concert hall. Thora says that pictures and videos of the event will be sent to their hero’s Twitter and Facebook pages in the hope that he sees them personally and answers their call. What if a Justin Bieber clothing and shoe line hit stores soon? Would you buy his fancy duds? Of course you would if you're a Belieber. Perhaps that's life for him after music. Never say never! Okay, Jay-Z has Rocawear, Diddy has Sean Jean, there's Victoria by Victoria Beckham, Elizabeth Hurley has Beach, and Jessica Simpson has about 22 different product lines including a collection of bling. While many of the celebrities have launched successful fashion lines, some not in the above examples haven't done well at all. But if Justin Bieber has his eyes on the success of Jessica Simpson (possible billion dollar empire), maybe he's on to something. However, she represents the exception and not the rule. Nevertheless, during an interview with Women's Wear Daily (WWD), Selena Gomez's boyfriend hinted at the possibility of launching his own clothing and shoe line. "Definitely, I want to eventually start a clothing line or a shoe line, something like that. But nothing is in the works now. I'm just focusing on my music now," the teen icon said. Check him out; he's only 17 years old and is already thinking ahead. They say one should not put all their eggs in one basket. Perhaps that explains why he is joining MTV's Punk'd and playing hoops quite a bit. Hey, Spud Webb won a Slam Dunk Contest. Surprisingly, JB said he keeps things simple with his style. "I try not to do too much. I try to keep it, I'm not sure what the word is — I don't get too dressy. I don't like to dress up. I really like to keep it casual," he said. But even when Bieber dresses down, he makes a fashion statement. Come to think of it, when he wears his pants to the ground, it actually looks—well—stylish. And whether it's Justin Bieber pictures, songs, a new haircut, or YouTube video, fans will love it all the same. A clothing and shoe line just makes sense. The Justin Bieber twitter feed always has goodies on it - whether it's details on his new Christmas album or shout outs to fans. Now, it's Usher that's taking to twitter to tell Bieber how proud he is of him. 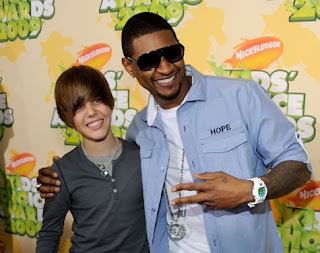 Of course, any good Belieber knows that it was Usher who first helped discover the star as a kid. Usher tweeted Justin Bieber today saying "@justinbieber...YOUR VOICE SOUNDS AMAZING in the Christmas album!! I can't wait!....You workin Bebito!! MAJOR...I'm proud!!! 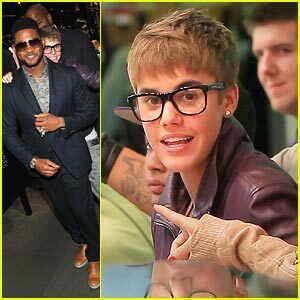 URIV" Bieber the promptly replied "YEAHHHH MAN!!" These two are a wonderful example of role models and mentors. Usher is certainly a huge mentor figure for the 17 year-old, and it's nice to see them interacting and having each other's backs. As for the term "bebito" - if you're wondering what that means it's a spanish term of endearment meaning little baby. The Christmas album that Usher mentions is an album that Justin Bieber's currently recording. It will feature all original songs and is highly anticipated by his fans. Nice to know that Usher approves and thinks it sounds amazing. Follow the Justin Bieber twitter page for up to the minute updates from the Biebs! He may be just 17 years old, but Justin Bieber already has his sights set on settling down. The teen popstar revealed during an interview that he plans to be married and starting a family by his mid-twenties. While that is considered rather young to be making such a commitment these days, the age would certainly seem far off to the teenager, who is still in high school. Speaking to Women's Wear Daily during Fashion's night Out in New York on Thursday, Bieber admitted: 'By 25 or 26, I want to see myself, like, married or start looking for a family. While his words might send the Beliebers - his army of loyal fans - into a frenzy, the person who may be most excited is his girlfriend Selena Gomez, who Bieber calls 'amazing' in the interview. But the Never Say Never singer makes one thing clear: 'I’m not looking to get married now,' he says. Bieber told reporters at the event on Thursday that he was missing his girlfriend, who is away on tour right now. The pair were reunited at the MTV VMAs last month where Bieber didn't mind showing the world his affection for the pretty singer. They kissed and hugged on the red carpet at the ceremony and Justin covered her in kisses while Selena was trying to present live on camera. Bieber is currently in the studio making a charity Christmas album. Discussing his difficult upbringing with single mother Patti Mallette, he said: 'I love what I do but I think it’s important to give back, especially for me. I was less fortunate. I didn’t have a lot. I grew up in geared-to-income housing. It was always rough for me. Justin Bieber and his team stop by Ray’s Pizza in New York City for a bite to eat after Fashion’s Night Out on Thursday night (September 8).